Neuroscience offers us a more precise way of talking about the mechanisms of meditation. 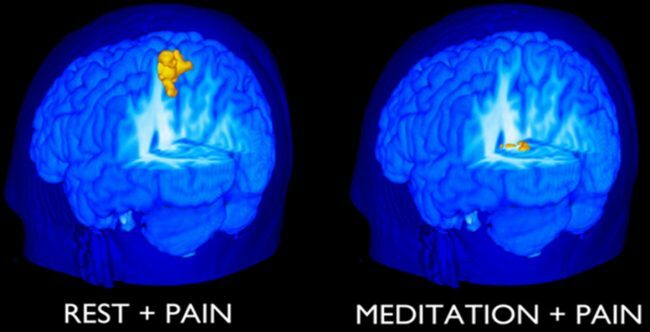 For example, we can recognize that in meditating we are exercising and thickening the parts of the brain that regulate the amygdala, which is involved in generating anxiety, and thus encouraging the amygdala to shrink, leading to long-term changes in our emotional being. Some of our older ways of talking about our experience, by contrast, are based on faulty metaphors. For example we used to say that emotions are like hydraulic fluids that will leak or burst out if we don’t express them. This isn’t how the brain works! Neuroscience gives us more accurate metaphors and thus helps us to understand ourselves better. Neuroscientists can actually see the changes I’ve described above taking place in the brain. Not only that, but they can see them happening over a timescale of a few weeks, rather than the years we might assume they might require. Most neuroscientific trials last only eight weeks. And in many of those trials, participants are meditating for an average of around 20 minutes. That isn’t a lot of time! If you’re one of those people who assumes that somehow you’re not cut out for meditation, or believes that only certain people (the “spiritual” ones) will experience the kinds of benefits I’ve outlined, then perhaps you will find confidence in knowing that exercising the brain is, in many respects, exactly like exercising the body. Just as repeated physical exercise will inevitably promote muscle growth or flexibility, so repeated meditation will help promote brain growth and emotional resilience. I’d like to add one caveat, which is that in talking about optimizing your brain I’m using a figure of speech known as a metonym. In metonymy, we use a part to represent a whole, or sometimes a whole to represent a part. So when we talk, for example, about combatting climate change in order to “save the planet,” we’re using a metonym. It’s not the planet we want to save, but the biosphere that lives on the planet. Similarly, when we talk about optimizing the brain, we really mean that we’re optimizing our entire being, or even our entire lives. That’s what we’ll be exploring in the 28 sessions of my online course, Optimize Your Brain. We’ll be focusing on brain research and meditation in order to bring positive change in a number of aspects of our lives, including developing greater calmness and focus, enhancing our ability to experience happiness, boosting our creativity and intelligence, bringing into being greater interpersonal harmony, and cultivating insight. The course starts on the 10th, Kornelius. Hopefully all the information you’ll need is in the link above. Hello, is this course still open for registration?